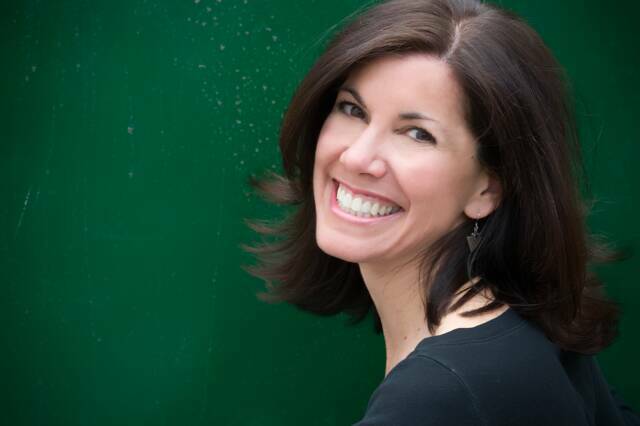 Today Biblio Links welcomes prolific picture book author Jean Reidy! Jean’s picture books are full of rhythm, rhyme, and fun–perfect for sharing with young and emerging readers. 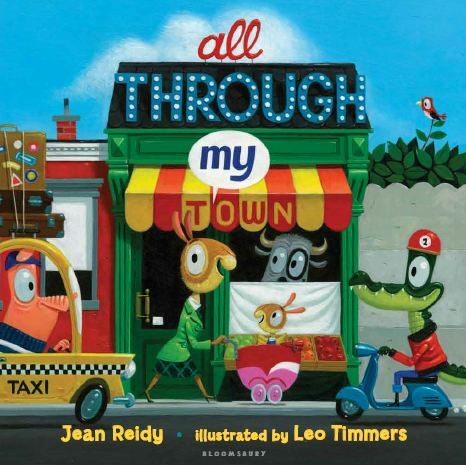 Her latest–and sixth!–picture book, All Through My Town, was released earlier this year to rave reviews. All Through the Town is a fun, rollicking romp through a fictitious town from a toddler’s point of view. The take-away here is that everyone counts–we all play a role in making our communities hum like a well-oiled machine. The text rolls off the tongue–perfect for reading aloud. Publishers Weekly calls the illustrations “…an undeniable feast for the eyes,” and a feast it is from cover to cover. Here’s what Jean had to say about using All Through My Town in the classroom. Biblio Links: A student walks into my library and I think: That kid needs a copy of All Through My Town. Who is this child? Jean Reidy: It’s a kid who is insanely curious, who loves to explore, fully engage and interact with a book, and who will spend gobs of time studying the illustrations. That kid might be one who demands rereads during which new details, discoveries and self-referential moments are revealed and reveled in. It may be a kid who is just on the brink of reading. He’s ready to proudly recite the text, aided by the rhythm and rhyme pattern. Finally, it’s a kid who devours all thing busy (think fans of Richard Scarry) – sites, sounds, vehicles – a kid who is possibly even wearing a beloved fire chief hat. Biblio Links: I love that there’s so much to discover in this book! The illustrations invite us to take a second look (and third, and fourth…) and the text is so catchy that even pre-readers will be reciting the text after a few read-alouds. If we were to peek into a classroom where a teacher is using All Through My Town in a lesson or with a small group, what might we see or hear? Jean Reidy: You might find kids dressed as community helpers and performing jobs in a classroom make-believe town, complete with a post office, library and grocery story. The class could be playing community helper Bingo or make-a-match with rhyming words or acting out the many action verbs used in the story. Students might be performing an oral reading – with the honking, beeping, shrieking, ringing, city sounds – as well as rapping with the rhyme, rhythm and repetition in the book. Or you might find a fireman or policeman visiting as a special guest speaking to the kids about safety. The class may even be “out” of the classroom, touring a local bakery or library or touring their own neighborhood and then drawing neighborhood maps. Many, many more ideas for use in the classroom can be found in my free downloadable teacher’s guide here. Biblio Links: The teacher’s guide really is amazing–so many activities to choose from! It also includes author and illustrator interviews, which are great for classrooms who do author/illustrator studies. Biblio Links: Thanks for joining us, Jean! This entry was posted in animals, community, picture books, rhyming and tagged All Through My Town, Jean Reidy, picture books. Bookmark the permalink. Sounds like such a fun book! Anything that has rhythm and rhyme is a book that students will love. Very cute. Perfect for the preschool/K age group! I should get for my buddy reading bin (we read with the K/1 class) I think Leo Timmers is such a fun illustrator. I have one of his books on my #IMWAYR list this week too. Thanks for hosting me, Natalie! And thanks to everyone who stopped by. Happy Reading!